On Tuesday, September 26 at 7 pm in the RMS/RHS Lecture Hall the RHS Travel Club is holding an informational meeting on their upcoming trips. As many students already know, trips have been planned to Japan (June, 2018) and Europe (April, 2019). This year they are introducing another trip to Australia and New Zealand (June, 2020). At the meeting on Tuesday night, Travel Club adviser, Kristen Walsh will provide in-depth information about the trips’ itineraries, fundraising, and time frames. Parents are strongly encouraged to go with students to the meeting. Sign-ups for the Europe and Japan trips have been going on for two years, but spots are still available for each. The Japan, Land of the Rising Sun, trip in the Summer of 2018 is open to current 9th, 10th, 11th, and 12th graders. The April Vacation of 2019 Central European Quartet trip is open to this year’s 10th and 11th graders. The trip includes tours of Munich, Prague, Vienna, and Budapest. At the meeting Ms. Walsh will introduce the opportunity to current 9th and 10th graders to the Journey Down Under trip to explore Australia and New Zealand in June of 2020. For more information see Ms. Walsh in Room 121 and join them at the meeting next Tuesday. Yesterday, September 13 marked RHS’s second annual school-wide Summer Reading Discussion. The event was created to try to put a fun spin on the normally dreaded summer reading. In June, teachers submitted their books, then students signed up to read one from the collected list. This year the option to read several articles from the NY Times newspaper was added. Over the summer, both the students and the teachers had to read their assigned books and then return in the fall to take part in a 30 minute discussion of their book, or the articles that they read. Each teacher had about 15 students in their discussion groups. Chris Herren’s powerful book about his addiction to alcohol, pain killers and heroin. Overall, RHS principal, Mr. Harrison said that at yesterday’s event many good conversations took place. He said he truly appreciates the teachers for their dedication and hard work. On the other hand, he did say that there is definitely room for improvement as he felt that not all the students had read the books that they had selected. Mr. Harrison led a discussion on one of the most popular selections, Chris Herren’s memoir, Basketball Junkie. Mr. Harrison concluded that he hopes the activity sparked interest in students to read these and other books. Book choices included a variety of genres including: non-fiction choices: biography, autobiography, history and science. Fiction selections included science fiction, mystery, fantasy and more. The NY Times articles were also separated by topics: Politics/US and World News, Sports, Arts/Style, Science and Travel. Students could choose to read articles in one of the areas. Ms. Rizzotti led a discussion of the novel, A Husband’s Secret by Liane Moriarty. Veritas photo. English Department Chair Carol Cahill had a big group to discuss The Dark Prophecy, Book 2 of The Trials of Apollo series. Veritas photo. Brian Fisher led a discussion of the NY Times Sports section in his book discussion group. Veritas photo. Mrs. Thompson and Ms. Medeiros lead a small group discussion about the NY Times Arts section. Veritas Photo. Below is the list of books that teachers submitted and that students selected to read. It was an exciting Friday afternoon as the Dogs’ football team would be opening up their season later that night. In the lunchroom, junior kicker Matt Dalton sat sharing a few laughs with a couple of friends. Some friends jokingly mentioned to Dalton, with no belief in the world that it would actually happen, that the game would be tied 0-0 and he would have to win the game with a field goal. To the shock of Dalton, and his lunch table, their prediction came true. With 14 seconds left in the game, Dalton put the Dogs up 3-0 and in a position to win the game. Despite having the entire game on his shoulders in this moment, Dalton remained calm and collected. The Dogs were able to hold on in the remaining seconds of the game and came out on top with the victory. The game was a grudge match as yards and points were hard to come by. Both defenses played exceptionally well and it wasn’t until the last drive of the game, after adjustments, where Rockland put the first successful drive together of the game. Rockland marched flawless down the field utilizing an array of running backs. A huge moment in the game was when senior Anthony Vasquez recovered a Rockland fumble to keep the drive alive. This play was a huge momentum boost for the team. “When I dove on the pile head first and saw that we had got the ball back, we all felt we had the momentum and it definitely helped us win the game,” said Vasquez. With many new parts to the team, it was important for the team to start their season in the right direction. With new quarterbacks Jon Barr and Dante Vasquez making their debuts under center, as well as new head coach, Coach Liquori, there was a lot riding on the line in this season opener. For senior captain Louis Casey, it meant a lot to him for the team to win their first game of the season, and to win it for Coach Liquori. “Winning that game meant a lot. The game showed how great of a job Coach Liquori has been doing preparing us for the season. The victory gave us a lot of excitement for the season,” said Casey. As their season opener fell on Coach Liquori’s birthday, the Dogs were able to secure the win and start their season off right. The Dogs are feeling good and working hard heading into their game at Abington against the Green Wave this Friday. The coaches stand for the National Anthem. From left, Nick Liquori, Fred Damon, Pete Harrison, David Roy, Chuck McDonald, and Wayne Leander. The offense gets the play from quarterback Dante Vasquez (2). Joe Walls (25), Cam Ryan (72)Joe Yeadon (81), Anthony DeCecco (75), Jake Benson (20), Joe Breadmore (53). Zach Sharland #87 is ready to go in the Dogs first game Friday night. The cheerleaders hosted jr. cheerleaders in the opening night game. The band played from the stands and then performed an awesome half-time show. 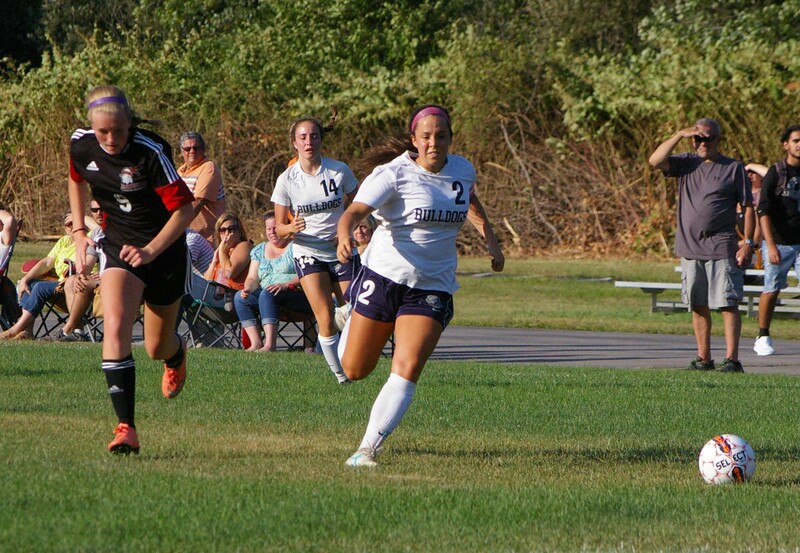 The girls varsity soccer team opened up its season at home on Tuesday, Sept. 5 with a convincing 6-1 win over North Quincy in a non-league contest. Rockland was led by Madison Blonde and Grace Oliver, who each had two goals. The girls play Wednesday against league opponent, Randolph, and on Thursday against Abington. The boys soccer team opened its season on Tuesday as well with a 5-5 tie at Randolph. The boys play Abington on Thursday. One of RHS’s favorite school-wide October events is right around the corner. The annual Breast Cancer Walk is taking place Sunday, October first and plans are already in gear. Since last week Student Government Council has been selling shirts for the walk at all three lunches for $20; they will be on sale until September 13. Along with that, bus sign-ups to and from the walk are starting today at all three lunches for $5. For the walk donations are also being collected throughout the month of September. The goal is for RHS to raise over $1000. Ms. Shaughnessy, Ms. Medieros, Ms. Paulding, and Ms. Armstrong have all committed to dying their hair pink if the school can achieve this goal. Donations are being collected in jars in A Block classes. Whichever class raises the most money will recieve a free breakfast.